For some reason hundreds of Creativelanders were spotted sporting green. And then they posed with other assorted green things. And since Prakash Ji couldn’t find the camera, the shoot was done by a Nokia phone. In one shift. Neil joins us from Sydney and all of us are very very excited to work with him. Here is the official press release. Neil Flory, who, years ago, made news when he became one of India’s youngest creative directors, is coming back to India; as ECD at Raj Kurup’s Creativeland Asia. There’s pretty much nothing that Neil hasn’t done in the last decade and a half. At 24, he was creative director at Enterprise Nexus. He has worked in five cities in three countries, in big networks and boutique creative hotshops. He has worked on above the line, below the line and everything in between. He has won almost everything that there’s to win in advertising. Here’s the list in brief. Along the way, Neil explored other areas of creativity too. He designed and made fish tanks that were featured in Inside Outside. He runs a clothing label for which he designs t-shirts and jeans. He spends all his free time making music. And, is also writing stories for kids. After all this, the process of creating an ad still gets him excited. A good idea gives him goose bumps, like it did when he started out. “Coming back to India was never part of my plans. But the opportunity to join Creativeland Asia was something I couldn’t pass up”, says Neil. “Neil’s coming on board will only strengthen the team and the creative output at Creativeland. His international exposure will be of tremendous value”, adds Vikram Gaikwad. More news and analysis on Campaign India, AgencyFaqs, exchange4media. We are in news again. For our shiny new office in Kochi and CLA Lab. Here is our news release. 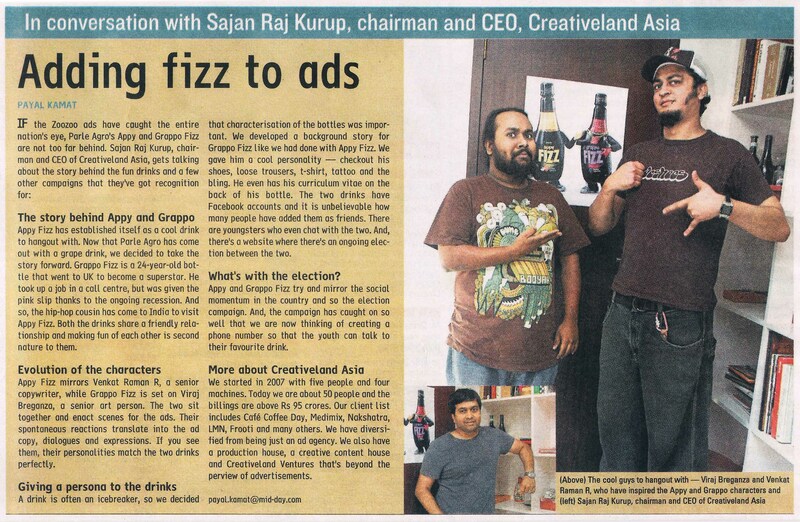 Creativeland Asia expands. Brings Sudheer Krishnan on board to setup its South operations and CLA Lab. While Creativeland has been strengthening its forays into the international/ Asian market with strategic tie-ups with local Asian agencies across markets, it has also been consolidating its presence in India. Just one year into the business, and Creativeland Asia is all set to open its second and third offices. While the office at Kochi will open its gates in the last week of September, news is still awaited on the other office which is also slated to open in the South. The Kochi office will also host the CLA Lab, India’s first creative laboratory for communication, brand and marketing ideas. CLA Lab will be a laboratory, a planning space and an ideas library. Exclusively for advertising & marketing minds of Creativeland, its clients and all its Asian partner agencies. CLA Lab will be used as a hub to workshop ideas, test market new ideas and test launch new advertising and marketing concepts and strategies. In addition to the physical space to huddle and brainstorm, CLA Lab will provide the complete back-end support required for such activities. Sudheer Krishnan, who was till recently Vice President, TBWA – Kochi, will spearhead Creativeland’s venture into God’s own country. He will also entrusted the responsibility for CLA Lab. In his previous position at TBWA, Sudheer Krishnan was influential in strengthening and building a strong brand equity for TBWA in the southern market. Under his leadership TBWA scaled great heights including bagging the title of ‘Agency of the Year’ two years in a row at Pepper, the biggest event down South. In a career spanning 21 years, Sudheer has worked on the businesses of Hindustan Lever Ltd., Harrisons Malayalam Ltd., Coats India, Tally, Acer, Birla 3M Ltd., LIC Housing Finance Ltd., Bajaj Allianz, Sapat Tea, BPL Mobile Communications Ltd., Sonata Software Ltd., Mascot Systems, BPL and Standard Chartered. “CLA Lab will give us the space to work closely with clients to identify opportunities for growth, and to design and build new offerings,” says Vikram Gaikwad, Partner & ECD. For Creativeland, CLA Lab will be the brand planning space. It will also be the workshop of Creative Apprentices where they proactively think up ideas and create brands and content. “The only thing that differentiates Creativeland from its competition is the quality of idea we produce. 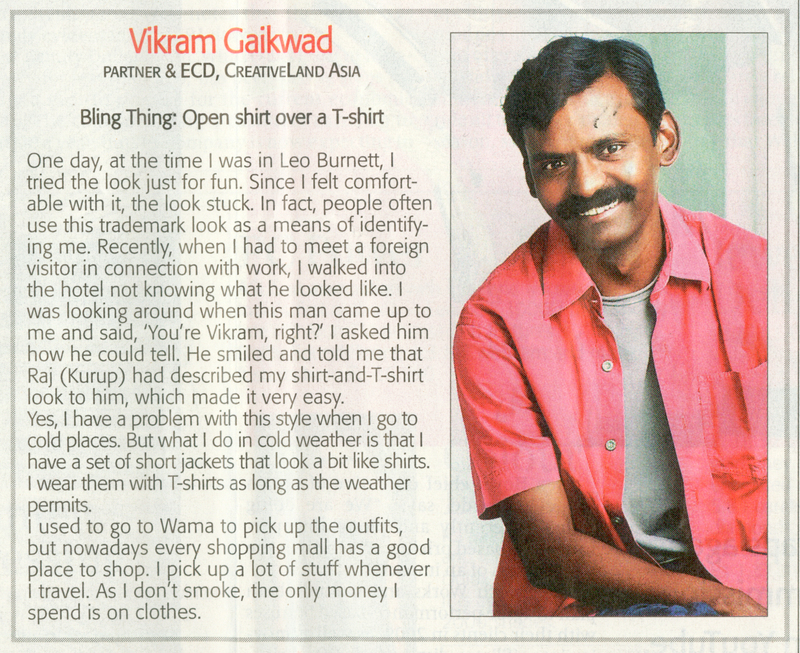 Every investment we make at Creativeland is keeping just that one thing in mind”, asserts Raj Kurup. For members of YoungCreative.org, the youth wing of Creativeland Asia, CLA Lab will provide an opportunity and space to work on brands, unfettered and free. As Raj Kurup says, “It’s a great place to find answers”. And in case there are ideas and thoughts on the same, please let us know. We are just one email away. UPDATE: afaqs, Campaign India and Exchange4Media are already talking about us. UPDATE 2: Prof. Harish features us on his very famous Marketing Practice blog. Prof. Ray also speaks about us on his Buyer Behaviour Blog.